After each Patriots game, I'll be taking a look at the game film via NFL Game Rewind and posting my observations. Here's a closer look at how the defense adjusted after a rocky start to shut down any hopes of a late Cincinnati comeback. Expectations were undoubtedly high for the Patriots defense entering this 2016 season. Stacked with young, homegrown talent at every level, the defense was supposed to make the jump this year from "very good" to "elite". In fact, many believed the defense would have to carry the offense during the Tom Brady-less first month of the season. We're now six weeks into the season, and many Pats fans find themselves underwhelmed with what they've seen defensively so far. While the Pats rank second in the league in scoring defense, allowing a mere 15.2 points per game, there have been long stretches of troubling play that don't match up with that statistic. After spending the past few seasons amongst the league leaders in takeaways, they've dropped to middle of the pack in that category. They've allowed an alarming 44% of third downs to be converted, the sixth worst mark in the league. Perhaps the most stunning is ranking 29th in red zone defense, having allowed opponents to score a touchdown on 71% of their red zone opportunities. Sunday's clash with the Bengals saw more disappointing defensive play. 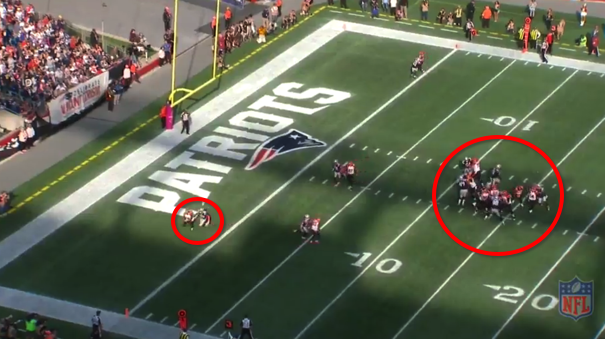 The first Bengals possession saw them move the chains twice before Malcolm Butler made a fantastic individual play on third down, tackling Brandon LaFell just short of the sticks on a crossing route. Their second possession saw them hold the ball for 16 plays, eating up 8:52 of game clock. They moved the chains five times on the possession, converting three third downs, as they moved the ball 89 yards before getting stopped on downs on the goal line. While the defense deserves credit for buckling down in the red zone, it was hardly an inspiring possession for the defense, who couldn't capitalize on multiple opportunities to get off the field. The Bengals wouldn't be denied the end zone on their following possession, as they needed only seven plays to move the ball 60 yards on a drive that culminated with Andy Dalton's rushing touchdown. 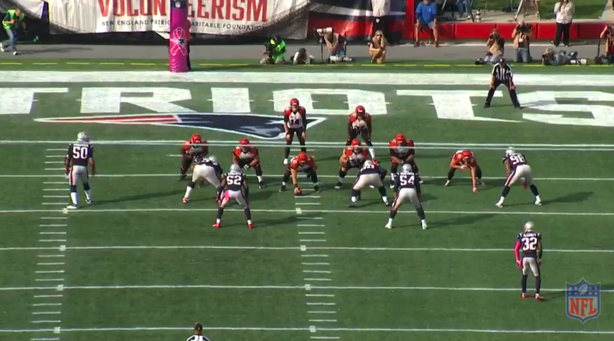 The Pats managed a stop on the Bengals final possession of the first half (one which began with just a minute remaining in the half), but Cincinnati opened the second half with a 9 play, 80 yard touchdown march. At that point, Cincinnati had a 14-10 lead and momentum firmly on it's side. Things clearly changed after that. Cincinnati's next four possessions totaled just 55 yards, resulting in a safety, two quick punts and a field goal. The Patriots offense took advantage, turning their four possessions during that span into three touchdowns and a field goal. 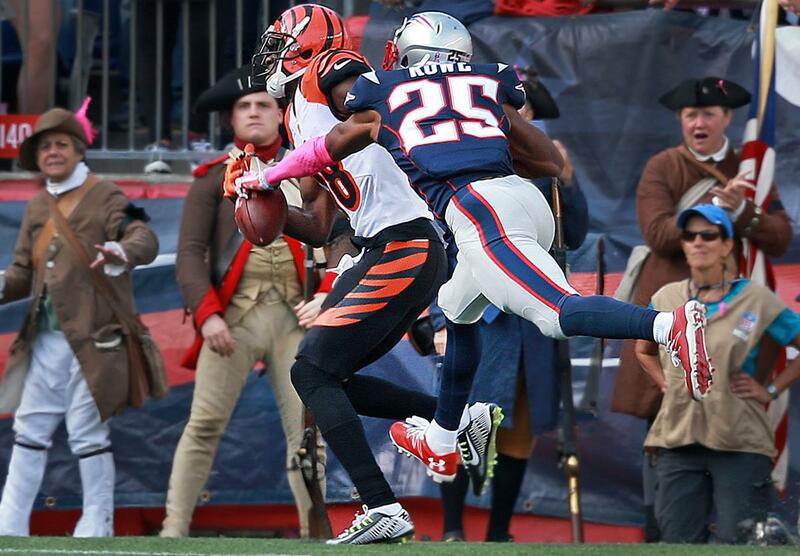 The end result was a 35-17 final score that belied how the Bengals had hung with the Pats for much of the game. What changes led to that drastic defensive turnaround? Two simultaneous scheme adjustments in the secondary helped to eliminate the chunk passing plays that killed the Pats defense in the second half. The first was a simple personnel switch. The Pats spent the first half of the game primarily in a three safety nickel package. 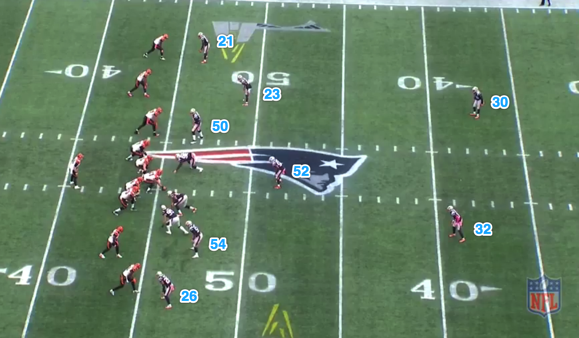 Devin McCourty and Duron Harmon were typically both back, splitting deep responsibility, while Patrick Chung acted as the de facto nickel corner, normally matched up with either slot receiver Tyler Boyd or a tight end. Logan Ryan spent largely matched up on star receiver AJ Green, while Malcolm Butler checked former teammate Brandon LaFell. 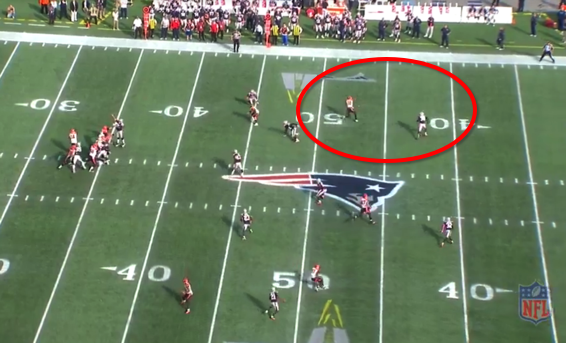 This package struggled to cover the Bengals for much of the game, with Green being the primary culprit. They weren't helped by a steady diet of zone coverage, which Dalton and Green were consistently able to exploit. 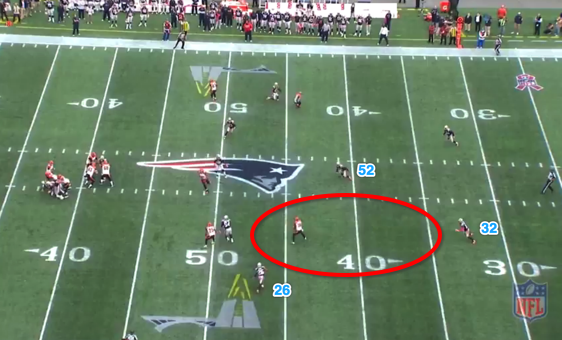 For example, the snap pictured above predictably resulted in a basic cover 2 zone from the Patriots, with Elandon Roberts (52) dropping deep to cover the middle and McCourty (32) and Harmon (30) splitting the deep halves of the field. This look is designed to prevent the deep ball, but it offers all kinds of space in the intermediate zones in front of the deep safeties. On this play, Green quickly beats an attempted jam by Ryan and takes advantage of that space, hauling in an easy 16 yard completion. That turns a bad 2nd & 24 situation into a manageable 3rd & 8 that the Bengals would convert to extend the drive. ...and this, the very next play, where Dalton is flushed out of the pocket but finds Boyd wide open for a 23 yard gain in front of the deep safeties. That scoring drive to open the third quarter appeared to be the final straw for Belichick and Matt Patricia, who completely scrapped their game plan from then on out. From then on out, the nickel package became a three cornerback look, with Eric Rowe in and Harmon out. Gone with Harmon were the cover 2 zones that had been a staple of the defense up to that point. From then on out, the Pats played a steady diet of match-up based man coverage, with Butler remaining on LaFell, Ryan switched to Boyd, Chung taking the tight end and Rowe on Green. Talk about a first assignment for Rowe, who was making his Patriots debut after missing time early with an ankle injury. A second round pick of the Eagles last year, Rowe flashed potential in an up-and-down rookie season last year, but fell out of favor with the Eagles new regime. The Patriots, who were reportedly interested in Rowe during the 2015 draft, pounced when he became available, trading a conditional 2018 fourth round pick (with potential to turn into a third rounder) to acquire him. That's hardly a bargain price for a relatively unproven player, but it spoke to the team's belief in Rowe's upside as a big (6'1", 205 pound), lengthy press corner. Rowe's combination of size and length makes him uniquely qualified to check other team's top receivers, but it was surprising to see the Pats trot him out against Green in his first action with the team. However, Rowe didn't just survive this challenge but excelled through it. All in all, Rowe was targeted three times, allowing two catches for just 10 yards. The first saw him display exceptional change-of-direction quickness, breaking on a quick hitch by James Wright to tackle him in front of the sticks on 3rd & 2. The second was even more impressive. Rowe, who at this point was tracking Green snap-to-snap, lined up across from Green one-on-one in the slot. The Pats sent a whopping seven players on the rush against Dalton, trusting their four in coverage (Rowe vs Green, Ryan vs Boyd, Butler vs LaFell, McCourty vs tight end C.J. Uzomah) could hold up one on one long enough for the blitz to get home. Dalton recognized the blitz and quickly went to his star receiver, but Rowe did a fantastic job staying right on Green's hip before using his length to knock the ball away. That all-out blitz call was indicative of the increased aggression of the Patriots overall defensive scheme in the second half. After spending most of the first half with vanilla three and four man rushes, the switch to man coverage coincided with a more aggressive approach to the pass rush. While the Pats weren't necessarily blitz heavy, they used plenty of deception at the line of scrimmage to create pressure, even when rushing just four. Dont'a Hightower's game changing safety was a perfect example of such disguised pressure schemes. Take a look at the defense at the snap. 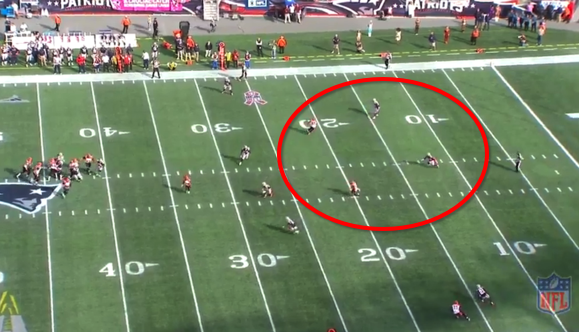 Every thing looks normal here, as the Pats have two interior players, two edge rushers and two off-the-ball linebackers. Things get wacky once the ball is snapped. Ninkovich (50) and Trey Flowers (98) are expected to rush the edges, but instead begin dropping back into shallow zone coverage. Meanwhile, Alan Branch (97) has angled his rush to the outside, where his pure size and power draws the attention of both the right tackle and guard. 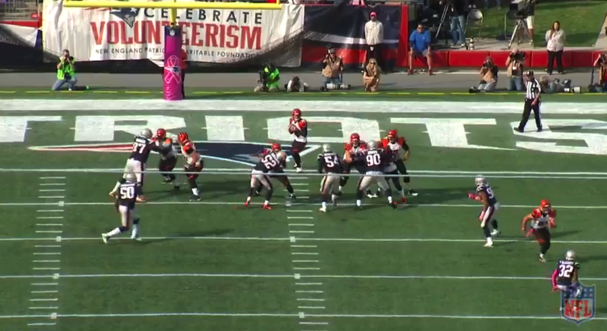 Elandon Roberts comes hard on a blitz and is picked up by the center. Malcom Brown (90) has veered his rush slightly to the inside, occupying left guard Clint Boling. Andrew Whitworth (77), the Bengals best pass protector, is left on an island with no one to block whatsoever. With Brown occupying Boling, there is a clear gap for Hightower to come through. He shows impeccable timing, delaying his blitz just enough so every Bengal blocker is committed to their assignments before exploding through the A gap. 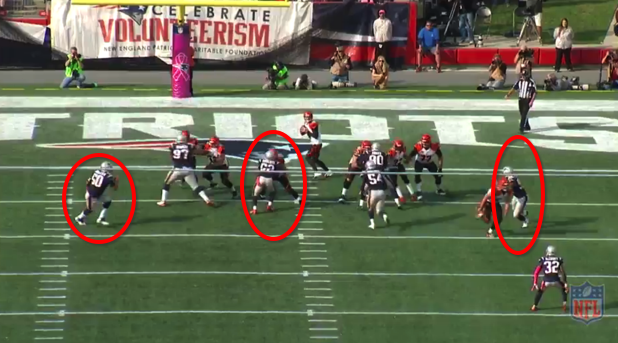 Boling recognizes Hightower coming late and peels off of Brown to try to cut him off, but he's already way too late. The result is a monster, momentum shifting play that marked a clear turnaround for the Pats the rest of the way. This is the kind of aggressive defensive scheming that made the Patriots defense one of the league's better units over the past two years. While a return to aggressive press man coverage was expected in 2014 with Darrelle Revis in the fold, that approach continued with much success in 2015, as Malcolm Butler and Logan Ryan emerged as quality starters capable of matching up with the league's best receivers. For whatever reason (perhaps they've been protecting Butler, who was battling an ankle injury earlier in the year), the Pats have spent large portions of 2016 straying from that approach, going instead with soft zones that have yielded plenty of easy completions and third down conversions. Likewise, disguised pressure packages have shown up here and there, but they haven't been nearly the steady presence they were last year, when the team had their highest sack total (49) of the Belichick era. I touched on the same subject after the Buffalo loss, when a conservative, zone-heavy approach led to far too many easy completions for Tyrod Taylor, and I find myself writing about it again now. This Patriots defense returns all the key personnel from last year's top notch secondary. They might even have a major upgrade at third corner if Rowe can prove that Sunday's breakthrough wasn't a fluke, as he is a unique chess piece seemingly designed to match up against bigger receivers. The personnel on this team is capable of matching up with nearly any group of passing game weapons and smothering them with tight, press-man coverage. It's how they were successful in 2015, and it's where their successful moments have come from this season. If the Pats defense is to rediscover the shutdown form they maintained for much of the past two seasons, my guess is re-committing to that aggressive defensive approach- both in coverage and in the pass rush- will be the catalyst. It certainly was this Sunday against the Bengals.